Founded in 1981, Invest Cast, Inc. has steadily grown its casting, machining and fabrication business with an emphasis on innovation. Using the latest technologies, training and techniques, Invest Cast now has three U.S. locations where it produces superior quality investment castings and delivers unmatched industry and technical experience. 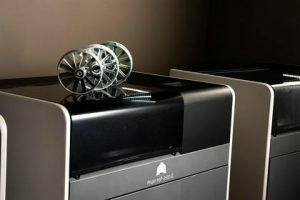 In the company’s ongoing mission to deliver exceptional projects with unmatched customer service, Invest Cast recently purchased two ProJet® MJP 2500 IC 3D printers, 3D Systems’ new digital foundry solution that uses 100% RealWax™ investment casting wax to deliver fast and cost-effective, tool-less wax pattern production. 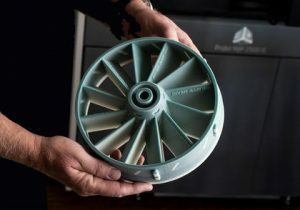 By eliminating tooling, this new 3D printing solution reduces the time and expense of transitioning from a design to a cast part, and 3D Systems’ wax material integrates seamlessly into standard investment casting workflows. Invest Cast reports exceptional surface finish, dimensional stability and castability with the ProJet MJP 2500 IC, and is now able to serve more customers with greater efficiency. Invest Cast is now positioned to introduce low-volume tool-less production for high quality cast parts in a fraction of the typical time. The ability to make final cast parts without tooling a mold has given Invest Cast’s customers the freedom to test multiple iterations quickly and cost-effectively, ultimately enabling them to arrive at better final parts. According to Al Hinchey, prototype specialist at Invest Cast, the ProJet MJP 2500 IC has cut significant time from the investment casting process. 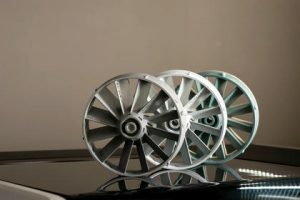 “Many times, we can go from model to metal in 2-5 days,” he says, which is down from the average lead time of approximately 6-12 weeks with investment casting molds. The ability to quickly deliver high quality casted parts sets Invest Cast apart from traditional foundries and offers Invest Cast customers a premium experience marked by exceptional service. The part accuracy and dimensional stability of patterns printed with the ProJet MJP 2500 IC have enabled Invest Cast to produce more complex parts with much finer, castable details than ever possible previously. Built using 3D Systems MultiJet Printing (MJP) technology, the ProJet MJP 2500 IC delivers patterns with tight tolerances that are ideal for complex precision metal components and uses VisiJet® M2 ICast material, a 100% wax material that shares the melt and burn-out characteristics of standard casting waxes. Hinchey reports a quick and easy installation process, with a crate-to-first-build time of just five hours. 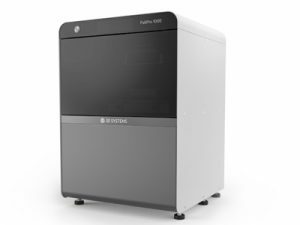 The ProJet MJP 2500 IC ships with 3D Sprint®, an additive manufacturing software unique to 3D Systems for preparing, optimizing, and sending files to print in a user-friendly workflow. “You no longer have to be an expert in the more complex CAD drawing programs,” says Hinchey. After the shells are dewaxed, they are loaded into preparation ovens for preheating just prior to pouring. Once the metal has been poured and the patterns have cooled, the ceramic shells are removed, disconnected from the tree assembly and ground free of the gate material before final heat treatment or shipping. Given the quality, cost and business advantages the ProJet MJP 2500 IC has already introduced, Invest Cast is convinced digital foundry solutions are the way of the future. “This technology is going to be the next step in the next generation of investment casting,” says Albert. Get in touch for more information on the ProJet MJP 2500 IC and transform your casting workflow with our digital foundry solutions.